Not so long ago we were present at the death of one of Napoleon's closes friends and today, we find ourselves once more on the Napoleonic battlefields in the heat of conflict. 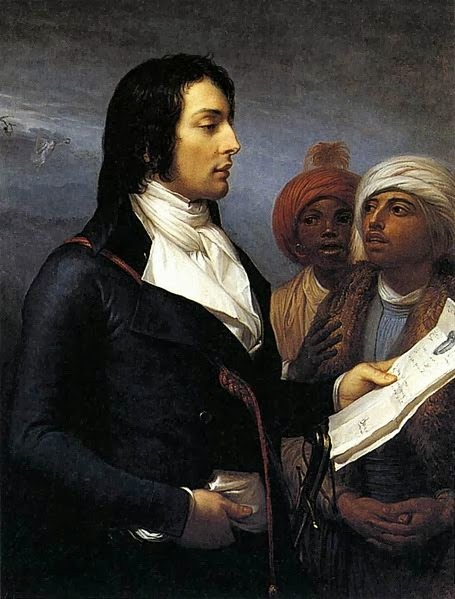 I was first set to thinking about the celebrated general, Louis Desaix, when his brief appearance by portrait in my post on Andrea Appiani drew many admiring glances so today he features in a story of his own, though not a happy one by any means! Desaix rose from poverty to high military office and decoration, eventually becoming one of Napoleon's most loyal and trusted retainers. His death came at Marengo, Italy in 1800 just days after his arrival to join Napoleonic forces there and take on an infantry command. As Desaix led his men towards engagement, he was met by a member of Napoleon's personal retinue who informed him that the battle was already turned, the Austrians were on the cusp of victory against the French. Desaix pressed on for an interview with Napoleon and told him, "This battle is lost, but there is time to win another!". The words rallied Napoleon and the battle continued under Desaix's command. The French held Marengo that day, but at the cost of thousands on both sides and one of those who lay dead was Desaix, shot through the heart with a musket ball. Desaix's body was buried initially in Milan and then, five years later, was moved to a ceremonial tomb at the Great Saint Bernard Pass. He is honoured on the Arc de Triomphe, a pivotal figure in the Battle of Marengo and the military life of Napoleon. Why am I getting a picture of white fluffy meringues....? Gawd, these battles were awful! Tempted to make a political comment about how the EU has stopped individual countries seeking military dominance, but nobody learns the lessons of history, do they. If Appiani has not exaggerated, Desaix was indeed a very handsome man The battle of Marengo was won, but at the expense of so many lives. The suffering and death toll in the Napoleonic Wars were beyond all measure for one man's ambition.